Maybe I’m just greedy? That makes sense because that also explains my gravitation to Coffee Milk Tea (and Black & White Cookies), the combination of the two favorites. Yup, I want it all. Coffee Milk Tea is commonly sold at Chinese bakeries (for about $1) and made extra sweet and creamy, going past the normal amount you usually put in tea or coffee. More like having a hot chocolate, it borders dessert, and it deserves such praise. But, if you’re making it at home, you can adjust to your own tastes. You don’t need to be very precise in measurements. Basically Coffee Milk Tea is half coffee, half black tea, with a milk (milk, heavy cream, or condensed milk) and sweetener. This is another one of those times where the recipe is not necessary but I’ll throw one in anyway for those who find comfort in it. Combine coffee and tea in a heat proof cup. Add sweetened condensed milk or heavy cream and sugar to taste. *For the black tea, you can use loose leaf or tea bags. For loose leaf, Assam works best. For tea bags, use English Breakfast or something general like Lipton regular. posted by jessica	at 10:15 AM	Filed under Chinese, Drinks, Recipes. You can follow any responses to this entry through the RSS 2.0 feed. Both comments and pings are currently closed. What an interesting drink combining coffee tea and milk! I would love it with condensed milk, sounds yummy! Very interesting…I am intrigued! Beautiful pictures – I will have to give this a go! Hee hee, I’ve only enjoyed this with boba, and it’s delicious! I’ve never considered making it at home. I’m like you – I love both drinks and I also think I drink both every day!!! Love this! I always order this at HK cafes. I’ve never had this–sounds yummmy! Mark, I guess that could give you the added caffeine boost too. Grace, hahahahaa, some cocktails could have long names. Kim, no, what is stocking milk tea??? Jen, I guess we’re too high energy chicks! You make milk tea by using stocking silly 🙂 It’s very popular in HK. Kim, no way! I did not know. My father put condensed milk in his coffee every morning of his life! And on his toast. I am a tea drinker. Don’t like coffee at all….so while this drink sounds fascinating, I’ll have to pass on this one. However, I am sending your recipe to my sister who loves both! Barbara, let me know what sis thinks. I make a lot this recipe at home, but I do it differently, I brew the tea (usually Earl Grey) directly in whole milk, add shots of espresso (can be substituted by instant coffee)and some molasses sugar… Its exactly the same taste I loved at the HK style restaurants in Taipei… You should try it! Cocinillas, thanks for leaving a comment! =) Your way sounds like the real deal. The method I’ve posted just looks like how they do it in the cheaper bakeries. I love yeun yeung and have decided to make it my drink of the month at the office. But, to make real yeun yeung, you have to use evaporated milk. One of my colleagues at work said that I should explain the “real yeun yeung” statement in my previous comment. Yeun yeung is a combination of milk tea and coffee. 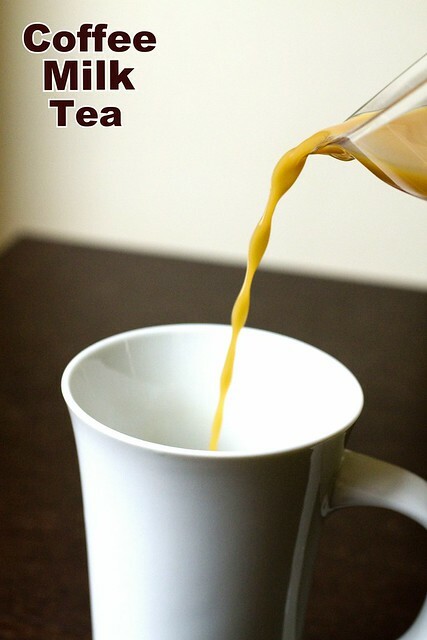 The traditional recipe for milk tea uses evaporated milk, which has a distinctive flavor that’s different from cream or condensed milk (other than there being no sweetness). If you use condensed milk in the milk tea, that’s an entirely different drink with a different name. That drink is called “tea leave,” which means “give me the tea, but leave out the evaporated milk and replace it with condensed milk.” Also, if you use cream, that’s just English tea, not milk tea. When you mix English tea that has cream and sugar in it with coffee, you won’t get yeun yeung because yeun yeung requires milk tea (which you didn’t make when you added cream to your tea). That’s what I meant by my above comment–if you want to make real yeun yeung, you have to use evaporated milk. Nonny Nu, you’ll notice that Cocinillas has a different version as well and I believe I’ve seen many different versions depending on where you are, HK, Taipei,NYC, etc. As far as I know, there has not been any authority dubbing one as “real” and the others not. Milk tea was created in Hong Kong using evaporated milk. Coffee milk tea was also created in Hong Kong, using coffee and milk tea made with evaporated milk. That’s all I’m saying. Of course there are different versions in different regions. (My mom makes “burritos” with bean sprouts and hoisin sauce.) But, if you want authentic (Is that a better word than “real?”) milk tea as it was originally made in Hong Kong where it was first named “milk tea,” then you’d have to use evaporated milk. Doing anything else will give you something different and will most likely (if your recipe is followed) result in English tea or tea leave. If that is called “milk tea” in regions outside of Hong Kong, then that’s a bastardization of milk tea. As said before, the evaporated milk gives the drink a distinctive flavor that you can’t get with condensed milk or cream. If the readers would like to savor this distinctive flavor as the drink was originally intended to embody, then they must use evaporated milk. I mean, think about it. If you add cream and sugar to black tea, that’s an ordinary English tea. There’s no need to go into Chinatown for that. In essence, such a recipe for “milk tea” would be no recipe at all because it results in an ordinary drink that everyone and their mothers can have at the office. Why are you putting up the recipe? To introduce your readers to something they don’t normally have. By substituting cream or condensed milk, you have made milk tea and coffee milk tea into something lacking the distinctive flavor that their creators intended for them to have. Nonny Nu, I understood the same from before but where our understandings probably differ is that my parents are from Taiwan and I grew up in NY. Are you from Hong Kong? I’ve had many many versions including a very popular version made with non-dairy creamer. I consider them all “real”, especially since milk tea, which is associated with bubble tea originated in Taiwan. 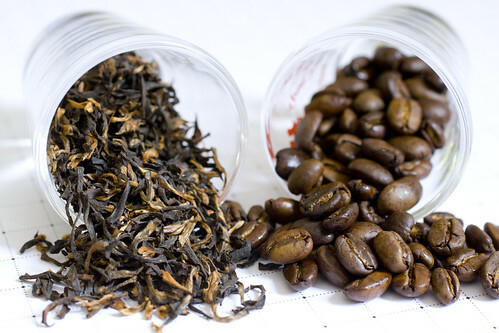 Where it differs from any old tea is that I tend to think Assam tea works best, but I also left the recipe loose because the point is to try it, for those who have never had or cannot gain access to certain ingredients. This blog is read by people all over the world, and often readers may not be able to obtain certain ingredients. Your argument is akin to saying New York pizza is not pizza and you can’t put sriracha in your pho and still call it real pho. Who would be so silly as to say a style of something is not that thing, or that adding a condiment to something makes that thing into something else completely? But when you say “yuen yeung,” I assume that you’re referring to the original HK yuen yeung with the required ingredients of coffee and milk tea made from evaporated milk. If you have these three components, you will have yuen yeung. If you don’t, then you won’t have yuen yeung. You might call whatever you have “Taiwanese coffee milk tea” or even “yuen yeung,” but you would be lying to yourself (perhaps unknowingly). Don’t worry, though, my sisters and I still call my mom’s “burrito” “burrito” when she’s around. From your post, it seemed to me that you were referring specifically to the Hong Kong coffee milk tea because you used its specific name–yuen yeung. That’s why the specific ingredients that go into Hong Kong yuen yeung is important (the “HK” is actually redundant because “yuen yeung” means you are referring to the Hong Kong drink). The main components of YY is coffee, tea, and evaporated milk. You can add all sorts of other stuff to it and then it will be a modified yuen yeung, but it’ll still be a yuen yeung. Perhaps I’m reading too much into your use of “yuen yeung” at the beginning of your post, and you only meant to refer to coffee milk tea as a general category. That would account for our disagreement here. I appreciate your intention of leaving the recipe loose for the world to try, but evaporated milk is probably easily had in all parts of the world. I was a refugee from Vietnam (my family is Cantonese and my grandparents moved to Saigon for business and got stuck there during the war) and I was raised in the San Gabriel Valley in a Hong Kong-oriented family and community (I still watch TVB on yummybun.com today). Even in our refugee camp in Malaysia (I was 2 years old at the time), we had evaporated milk. Plus, it’s nice to have alternatives to an ingredient but only if you actually say what the original ingredient should be. Finally, are you saying that milk tea originated in Taiwan? Or just bubble tea? I understand that bubble tea originated in Taiwan but it stems from milk tea, which I believe originated in Hong Kong. Even the name you use to refer to the coffee milk tea in your post is what the Hong Kongers named coffee milk tea (yuen yeung). If I remember correctly, I started seeing bubble tea in the 1990s (which means that it probably became popular in Taiwan in the 1980s) but I know that yuen yeung has been a staple in Hong Kong since at least the 1960s (my sister’s boyfriend who grew up in HK in the 1960s confirms this). Since yuen yeung refers to the HK concoction of coffee plus HK milk tea, in order to have authentic yuen yeung, you have to use evaporated milk. In the video, you’ll see that the use of condensed milk is popular in Singapore but HK milk tea is made with evaporated milk. There is a definite difference in taste. Then, the owner of the cha chaan teng also says that use of condensed milk results in tea leave (cha zhou). Nonny Nu, my analogy is exactly spot on because in Taiwan and in NY, they will call these drinks with any type of dairy/non-dairy creamer choice Yuen Yeung and you are not the authority to call them wrong (neither is youtube but link was wrongly directed anyway) . We can agree that to say the HK style of Yuen Yeung is made with evaporated milk, but the milk tea that originated in HK is a version of came over from the UK. So then we could say that the milk tea from HK is not “real”…which leads me to why the analogy is spot on. Tons of the food in the world are influenced by other parts of the world. It doesn’t make them not real, possibly not to your liking if you prefer one style and that’s fine. I believe in Naples, they have strict rules for what is considered Neapolitan style pizza, but they have no authority to say that pizza in NY is not pizza. Same for the sriracha. Isn’t that another ingredient? Yes, I’m saying bubble tea originated in Taiwan. For a long time, they didn’t include coco de nato or jelly, or yogurt, but nowadays, they do. I don’t consider those other versions, not real bubble tea. If you’re comment had been something like, the HK version of Yuen Yang is made with evaporated milk, that would have been cool, but to say that all other versions are not Yuen Yeung is just really your opinion and one that insults everyone else. It’s a wonderful program. You know what occurred to me last night? It seems like this might be the first you’ve heard of using evaporated milk in yuen yeung. Wow, I totally feel sorry for you because it’s such a distinctive flavor (and because you write a food blog and posted about yuen yeung without listing the ingredient it was originally intended to have). You haven’t lived until you’ve tried it! It might be tough to get in NYC, though. Just google for a refugee camp near you and you might be able to find a can or two. I’m running low myself at the office, but here on the West Coast, the grocery stores always have it in stock in the baking aisle (next to the condensed milk). Anywho, please keep in mind that we are talking about yuen yeung, a drink originating in Hong Kong. This means that the Hong Kongers get to set the recipe for a yuen yeung. If you want to make Taiwanese or NY style yuen yeung, then so be it. But don’t kid yourself and think that you’re drinking what the creators of the drink intended it to be–especially since you are including an ingredient that the creators specifically excluded. The original yuen yeung was created in Hong Kong using a particular ingredient in their milk tea–evaporated milk. In Hong Kong where yuen yeung was created, condensed milk is not only NOT preferred, using condensed milk to make “milk tea” will get you a completely different drink–tea leave (“cha zhou”). Here’s the point, and here’s also why your analogies to pizza and sriracha are inapposite: If an ingredient is an alternative in the original recipe for X, then of course the product made with the alternative would be considered as part of the original recipe. In this case, the product should be called X. However, if an ingredient is SPECIFICALLY EXCLUDED and another ingredient is specifically named WITHOUT ALTERNATE, then you can’t technically call the product made using the specifically excluded ingredient to be “authentic,” can you? And if someone were to call that product “X” and tell the whole world that X is made using the excluded ingredient, wouldn’t that be a bit offensive to people who know that the creators had specifically excluded that ingredient? As far as I know, the Neopolitans have not excluded any ingredient that goes into a pizza. The Vietnamese also have not excluded any condiment (which is different than an ingredient) for pho. NY pizza includes the main necessary ingredients of a pizza as it is defined by the Italians. Pho with sriracha includes the main necessary ingredients of pho as it is defined by the Vietnamese. But, do you really believe that you could make a “pizza” without a crust and call that authentic? How about a “pho” with chicken broth instead of beef broth? Suppose the Italians have in their past something that’s pizza-like but is made of phyllo dough crust and they call it “mizza” and differentiate it from pizza. If New Yorkers made a mizza and advertised it as a pizza, would this be acceptable? This is why your analogy is inapposite–your examples embody the necessary ingredients of the original whereas your yuen yeung recipe substitutes a rejected ingredient for the necessary ingredient without ever even mentioning the necessary ingredient. Additionally, you’ll notice that Hong Kongers don’t call their drink “tea with cream and sugar,” and then hand you something with evaporated milk. No, they call it something entirely different: (evaporated) milk tea. If you order “tea with cream and sugar” in HK, you’ll get English tea with actual cream and sugar. You won’t get milk tea. That’s why the UK portion of your analogy is inapposite–milk tea doesn’t claim to be tea with cream and sugar. In other words, if New Yorkers made something with pizza sauce and cheese without a crust, and then DIDN’T call it a “pizza,” nobody would accuse them of making a fake pizza. So, yes, we can say that HK milk tea is not real tea with cream and sugar. That’s why we don’t call it that. By the way, it’s not “just my opinion” and it’s not youtube that’s calling the non-evaporated milk milk teas inauthentic. It’s the owner of a HK cha chaan teng (and probably all of HK if you could do a poll). But, this issue should be moot by now because you’ve agreed that HK style yuen yeung is made with evaporated milk. Realize that “HK style yuen yeung” is the ORIGINAL. It requires an ingredient that is easily found all over the world (perhaps even more easily found than cream or condensed milk in the poorer regions). This necessary ingredient was never mentioned in your post, and I suspect you didn’t know about it until now. Nonny Nu, I only read the first paragraph of this comment and then lost interest. I have had the version with evaporated milk, and with milk, and with non-dairy creamer (very popular among Asians when such a large portion are lactose intolerant), etc. I’m not interested in this argument because it’s really just one of self righteousness. Hello! I’m a bit late on this blog, but I just discovered this post when I was googling “coffee milk tea.” I love the stuff from boba shops, so thanks for sharing this find with the world! What I love best about the combination of coffee and tea is that you don’t experience coffee breath afterward. Beautiful stuff. There’s also a brand of tea, Cha Dao, that bottles a mix of coffee and black tea and calls it Yin Yang. It’s coffee, black tea, and sugar… but no milk. I used to be addicted to it, but then the grocery store I used to buy it from no longer sells it. I guess it wasn’t popular enough. Give it a go if you’re interested — buying it or brewing it yourself (it is expensive for a little bottle of tea, so brewing it yourself should be just fine since you already know how to make coffee milk tea). Cheers :). I always do this. Its good! Coffee and tea are poisons to the body and should be limited. Tea is dehydrating in it’s effect on the body. Coffee is also dehydrative, but probably not as much as what tea is. Thus, Coffee works differently on the body than tea does. If i drink a lot of tea during the day I can get pain in my lower intestine late at night, which keeps me awake. The remedy to this Is to get up and drink a liter of water and to jog for awhile. I have never experienced this with coffee. Coffee can keep me awake at night and can make me having to need to empty my bowels after a cup of it on an empty stomach in the morning. I find therefore that mixing the two, in a ratio of 3/4 tea and 1/4 coffee balances, somewhat, out the negative affects of both. I add a small amount of skim milk to adjust the temperature, and 1/4 of a teaspoon of sugar to give it a better taste.